Have you ever had a good look inside your washing machine? Perhaps not. After all, it’s pretty dark in there. But you might want to take a closer inspection the next time you do your laundry. Why? You’d be surprised how dirty a washing machine can get on the inside. Soap residue and calcium can build up over time, not to mention dirt that goes in with your clothing. And if you’re not careful, you can even end up with mold and mildew growing in the washtub! Whatever you do, don’t use bleach and vinegar at the same time! Mixing the two is dangerous. The first step to clean a washing machine is to run a wash cycle with your choice of cleaning solution. Empty the washtub. Your cleaning efforts won’t be as effective if there are stray socks left behind in the machine. Run a wash cycle with hot water (no detergent). Let the machine run just long enough to fill the washtub with hot water. Pause the cycle and add 4 cups of vinegar OR bleach (never both!) to the water. Remember, the water will be hot! Be cautious of steam. Run the cycle for a few seconds to mix the water, then pause for one hour. Let the cleaning solution do its work. Finish the cycle. Once it’s over, there should be no trace of the cleaner left inside, and most of the grime will be gone. The result? Your washing machine smells nicer, works better, and sparkles like its new. Running a wash cycle with cleaning solution should clean up most of the dirt, but stubborn stains and grime may require a bit of hands-on effort. Dip a cloth in a mixture of 4 cups of vinegar and 1 cup of warm water, then scrub the inside of the machine as necessary. Don’t use a scouring pad or any abrasive cleaners. 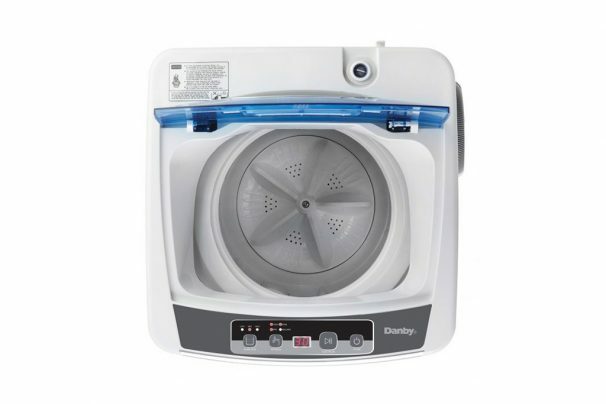 Want your portable washing machine to stay cleaner for longer? Here are a few practical tips you can use to keep the inside of your washing machine clean. Empty the washing machine as soon as possible. Ever notice a musty smell in the machine? Unfortunately, that’s a sign of mold. The longer you leave damp clothes sitting in the washing machine, the greater the chances of mold. Leave the lid open until all the water evaporates. Closing it before the washtub is dry is an open invitation for mold. Only use your washing machine for its given purpose: washing clothes. This may sound self-evident, but we’ve heard of people using the washing machine for things like sneakers, toys, backpacks, and sports gear. It may not cause any harm at first, but doing this can damage the machine in the long run.